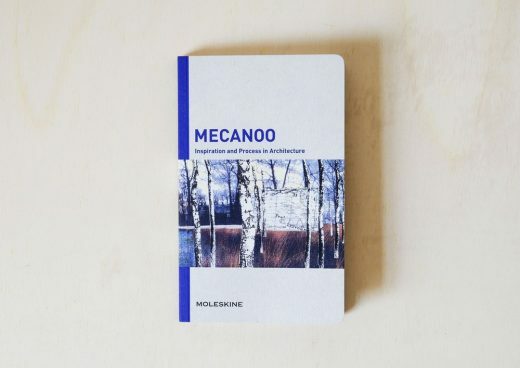 Moleskine publishes new titles in the series of monographs exploring the design process of international architects. The inspiration and the process are two factors underlying all design arts and specifically architecture: the Inspiration and Process in Architecture Collection, published by Moleskine and curated by Francesca Serrazanetti and Matteo Schubert, came into the architecture publishing scene in 2012 to explore the hidden stages of the architect’s work and to show the “behind the scenes” of a profession that often reveals only the outcome of a long process. The series — which already includes books devoted to the work of Zaha Hadid, Giancarlo De Carlo, Bolles+Wilson, Alberto Kalach, Cino Zucchi and Wiel Arets — has now grown to include two new titles: Studio Mumbai and Dominique Perraultl Two different points of view on architecture and reality offer the reader a glimpse at the notebook pages of two major architects located at ontipodes of the planet, revealing the most intimate aspects of their work. The volume dedicated to Studio Mumbai, the well-known Indian group of architects and craftsmen, shows the development of Bijoy Jain’s own mind- process as well as the collective dialogue through which each project evolves. Dialogues unfold through study sketches made by both Bijoy Jain and the Studios carpenters, as well as full—scale models and photographs taken on journeys as study and inspiration for future work, showcasing a critical part of their design process. Dominique Perrault’s “notebook” shows a collection of materials from the DPA office on the occasion of two international competitions for museum buildings An opportunity to demonstrate how even unrealized projects are a great opportunity for experimentation, these courses of research are told through sketches, models, notes and diagrams. The books structure — as in the whole Inspiration and Process in Architecture series — is organized in two sections: “Writings”, which include critical essays and an interview with the architect, and “Drawings”, which include images taken from personal notebooks and design materials specially extracted from their drawers, made with all kinds of artistic media, mostly manual but not excluding a few forays into digital. With these titles Inspiration and Process in Architecture is expanding its range to include new key players in contemporary architecture. Studio Mumbai and Dominique Perrault, like their predecessors, give an instant look into what inspiration and process in architecture” represents today: not only the manual gesture (sketching, drawing, taking notes) but all kinds of materials that collected and systemized, may become an inspiration for future projects The entire series traces out new “cognitive geographies”, offering different sources of inspiration for the architects’ world, capable of guiding personal processes that, starting from the white pages of a notebook, end up in the deﬁning stages of a project. Inspiration and Process in Architecture is a series of monographs on key figures in modern and contemporary architecture. July 22, 2013 in Books.